I recently had the opportunity to try out a Nook (the original, not the full color Nook) and thought I'd give a review of how it compares to the Kindle, which I reviewed last year. My first impression on looking at the Nook was that it's quite a bit smaller than the Kindle. I was worried that it might be harder to read on a smaller screen, but I actually found it comfortingly similar to reading a mass market paperback. The biggest difference between the Nook and the Kindle DX, of course, is the tiny full color touch screen used for navigation on the Nook. I liked that the keyboard was there when you needed it, and disappeared when you didn't. Weight. I've heard quite a few complaints that the weight of the Nook is a little too cumbersome. I actually didn't mind the bottom-heavy Nook, as it gives a nice solid feeling in your hands, without being heavy enough to wear you out. The screen of the Nook, with e-ink, was very similar to the Kindle, with maybe just the very barest hint more glare than the Kindle. Just like the Kindle, I found myself stupidly pressing the screen expecting it to do something (I am too used to my iPhone touchscreen) and found myself surprised that you really do need light to read by, since the screen obviously does not glow. One option that I really, really missed was the built-in dictionary that Kindle has. No such thing on the Nook. The Nook included a couple of games; chess and sudoku. I tried out the chess game and found it tough to navigate the tiny, full-color touch screen, and a little dizzying to keep switching from looking at that screen to the full-size black and white screen where the whole board is displayed. I didn't think the games were really necessary, but I could see myself playing them if I were stuck at an airport and wanted to pass a little time. In terms of battery life, I did find the Nook wore out much more quickly than the Kindle did. But, the Nook stood up to a week of heavy reading with wi-fi mostly switched on, which I thought was more than sufficient. Page turns seemed just a fraction faster on the Nook. I've heard that this is due to a recent software update. The Kindle DX always hesitates oddly every time you turn the page, making it tricky to finesse when you want to press the page-turn button. 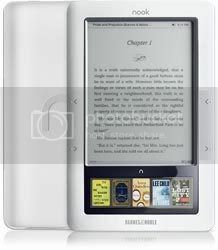 The Nook had page-turn buttons smoothly integrated on either side of the screen. Happily, the Nook allows you to switch fonts. There aren't very many options, but it's better than not being able to switch fonts at all. I also found, when reading PDF's that the original fonts and formatting were retained, which was nice. The Kindle doesn't use pages - instead, a progress bar shows up at the bottom of the screen, saying, 30% done, or what have you. I liked that the Nook uses page numbers. You can resize the font, which of course, will change the number of pages in the book. Is there an option to rotate the screen on the Nook? I couldn't find one. Annoyingly, I could not figure out how to turn the screen rotation OFF on the Kindle. Sometimes, I like to curl up on my side while reading, and the Kindle DX rendered this impossible, as it always wanted to "correct" itself and be read right side up, no matter which way I turned it. With the Nook, I was able to curl up on my side and read without the screen jumping around, trying to rotate itself. Just like the Kindle, the Nook makes it blindingly fast and easy to purchase books. Thinking about making a purchase? A click of a button and a few seconds later, the book is yours. It's not hard to go through your personal book budget more quickly than you ever thought possible on this thing. The place where the Nook really shines is, of course, in lending e-books. I found it easy and intuitive to transfer e-books checked out from my library to the Nook. With the Kindle, I did figure out how to find out a few free titles, but never did master downloading PDF's. Users who are new to Overdrive (a company which licenses e-books for libraries) may find the set-up process vexing. Expect to spend a good afternoon downloading Adobe Digital Editions, setting up authentication and so on. Obviously, you will also need a valid library card, at a library which has access to Overdrive. And, secondly, good luck finding e-books that are checked in -- demand for these items are soaring at libraries everywhere. In many cases, you have to get on a waiting list for popular titles. Still, the library titles are free, and you can't beat that. The Nook currently costs about $10 more than the bare-bones model of the Kindle, but it's hundreds of dollars cheaper than the DX. Despite the smaller screen of the Nook, I think the ease of finding free materials and the intuitively-designed navigation screen makes the Nook a superior choice. Oh, but the Nook does have a dictionary! I don't know how it works on the Kindle, but you need to highlight the word you want to look up on the Nook and then you can select the dictionary option. I swear, it's there. Somehow I missed that! Like I said, it was one of the things I wished for. I did a little hunting around... it looks like the dictionary only works on epub formatted items, not on pdf's. After reading the review here and checking out the poll at http://nookvskindle.info, it seems like everyone is gravitating towards the Nook Color. From comments I have read on several blogs, several ereader owners say they would have purchased the Nook color if available when they purchased their unit, while others said they preferred the Nook Color, but could or wouldn't pay the additional $100. I for one, am not convinced whether the color is worth the additional $100.